Did you miss your California traffic school deadline or court due date? Or is your traffic school completion date approaching? Will your auto insurance rates rise because you got a speeding ticket? Fact #1: You can complete your California traffic school on your due date! You have until 11:59 pm on the day of your California traffic school due date. That's because the California Superior courts and the California DMV look at the date when you complete the Defensive Drivers Group California traffic school final exam, not when they receive the information from us. 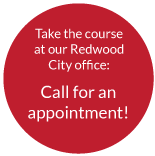 Extension example: The San Mateo Superior Court Traffic Division may grant "one 30-day extension to complete California traffic school if requested prior to the original traffic school due date." Extension example: The Los Angeles Superior Court Traffic Division also offers 30-day extensions to California traffic school, with an online request system. Extension example: Riverside Superior Court Traffic Division offers "two 30-day extensions or one 60-day extension from the appearance date on your ticket." Requests may be made online, by mail, or by the automated telephone system at 951.222.0384. Late certificate example: In addition to granting a 30-day extension, the Marin Superior Court Traffic Division may accept late California traffic school certificates: "Violators who complete their traffic violator school late, but within sixty (60) calendar days of the due date and, after the Court has already reported their convictions to DMV, may request that the Court accept their late certificates and send updated notifications of completion to DMV. There is a $50 administrative fee for this service." Ask for a traffic school extension right now. A second or third speeding ticket? Know the consequences. Additional traffic tickets in California could devastate your auto insurance rates. And in California if you get four or more points in 12 months you may be designated a negligent operator. That cannot be good for your auto insurance. Think California traffic school will help? Not if you get two tickets within 18 months. You can take traffic school in California only once every 18 months. So be smart and drive within the law. Our best tips for avoiding speeding tickets are: (1) obey the law and speed limits, (2) drive at speeds safe for conditions (the California basic speed law), (3) do not run red lights because red light cameras are everywhere in California, and (4) always drive safely! Can I get an extension if I miss my traffic school deadline? We cannot say yes or no. Only the California court in which you got your citation can grant an extension to traffic school. We do know that many California traffic courts grant traffic school extensions, and some accept late traffic school certificates. Asking could save you hundreds on auto insurance, so ask today. Where can I find my California traffic school due date? More and more California Superior Traffic Courts are moving to online systems to supply your traffic school completion date. The traditional method was for the court to mail you your due date 2-3 weeks after you pay your traffic violation fine and state fee that lets you take traffic school. Many California Superior Courts continue to do that, and some do that only for those who pay their fines by check. In contrast, if you pay online, then you will likely get an email giving you your due date. All of this assumes that you (1) paid your violation fees and (2) are eligible to take traffic school in California. Your best bet it is consult the Traffic Court webpage of the California court in the county where you received your traffic violation. You can also call us at 877-883-7290 and we will be happy to help you figure it out. Will my auto insurance company find out that I received a speeding ticket? We cannot say for sure, but the California DMV will record your conviction on your driving record unless you take traffic school. My traffic school deadline is tomorrow. Is it too late? It is possible to finish our course on time if you start the Defensive Drivers Group course immediately, but it is up to you to make it happen. Is a California traffic school deadline the same thing as a traffic school court due date? As related to traffic school, yes they are the same. But keep in mind that the court may give you other deadlines/due dates for paying your fine, appearing in court, etc.